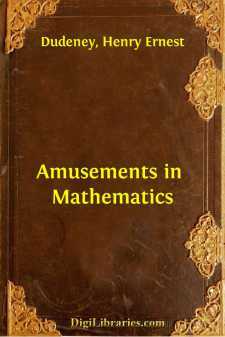 In issuing this volume of my Mathematical Puzzles, of which some have appeared in periodicals and others are given here for the first time, I must acknowledge the encouragement that I have received from many unknown correspondents, at home and abroad, who have expressed a desire to have the problems in a collected form, with some of the solutions given at greater length than is possible in magazines and newspapers. Though I have included a few old puzzles that have interested the world for generations, where I felt that there was something new to be said about them, the problems are in the main original. It is true that some of these have become widely known through the press, and it is possible that the reader may be glad to know their source. On the question of Mathematical Puzzles in general there is, perhaps, little more to be said than I have written elsewhere. The history of the subject entails nothing short of the actual story of the beginnings and development of exact thinking in man. The historian must start from the time when man first succeeded in counting his ten fingers and in dividing an apple into two approximately equal parts. Every puzzle that is worthy of consideration can be referred to mathematics and logic. Every man, woman, and child who tries to "reason out" the answer to the simplest puzzle is working, though not of necessity consciously, on mathematical lines. Even those puzzles that we have no way of attacking except by haphazard attempts can be brought under a method of what has been called "glorified trial"—a system of shortening our labours by avoiding or eliminating what our reason tells us is useless. It is, in fact, not easy to say sometimes where the "empirical" begins and where it ends. When a man says, "I have never solved a puzzle in my life," it is difficult to know exactly what he means, for every intelligent individual is doing it every day. The unfortunate inmates of our lunatic asylums are sent there expressly because they cannot solve puzzles—because they have lost their powers of reason. If there were no puzzles to solve, there would be no questions to ask; and if there were no questions to be asked, what a world it would be! We should all be equally omniscient, and conversation would be useless and idle. It is possible that some few exceedingly sober-minded mathematicians, who are impatient of any terminology in their favourite science but the academic, and who object to the elusive x and y appearing under any other names, will have wished that various problems had been presented in a less popular dress and introduced with a less flippant phraseology. I can only refer them to the first word of my title and remind them that we are primarily out to be amused—not, it is true, without some hope of picking up morsels of knowledge by the way. If the manner is light, I can only say, in the words of Touchstone, that it is "an ill-favoured thing, sir, but my own; a poor humour of mine, sir." As for the question of difficulty, some of the puzzles, especially in the Arithmetical and Algebraical category, are quite easy. Yet some of those examples that look the simplest should not be passed over without a little consideration, for now and again it will be found that there is some more or less subtle pitfall or trap into which the reader may be apt to fall. It is good exercise to cultivate the habit of being very wary over the exact wording of a puzzle. It teaches exactitude and caution. But some of the problems are very hard nuts indeed, and not unworthy of the attention of the advanced mathematician. Readers will doubtless select according to their individual tastes.